There have been comments over the years about the last Beadle double deck bodies to be built delivered to Southdown in Nov/Dec 1956 but few photos. To try and rectify this I attach two photos of this batch No’s 777-788 Reg No’s RUF 177-188, That of 783 was taken outside Pevensey Road bus station, whilst not a very good photo I included it as this bus was later converted into a tree lopper after an accident at I believe Jarvis Brook railway bridge which was near Southdown’s Crowborough garage, I heard that the unfortunate driver was an Maidstone & District man trying to reach the garage. That of 785 was taken in Pool Valley Brighton when being reversed on to the stand for the Brighton local service 38 which later became the regular haunt of the RESL/6L’s the route had a significant amount of hill work. Believed to have been built by Beadle on Park Royal frames, the easy way to tell these near identical batches apart was the Beadle’s had sliding ventilators and the Park Royal’s had half drops. In 1956/7, both NGT and Newcastle Corporation took delivery of batches of very similar Park Royal bodied vehicles. 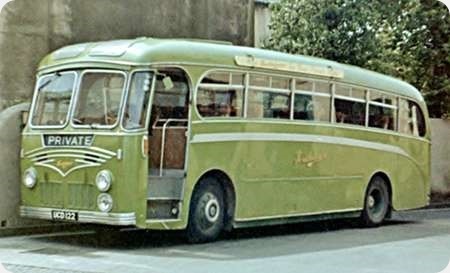 Those of NCT were all AEC Regent V.
The 1956 NGT group vehicles were GUY Arab IV, and the intake for 1957 were R/D versions on a Leyland PD2/12 chassis. Although they looked very similar to these, one notable difference was that both NCT & NGT were all four bay construction, whereas these are five. Further to Ronnie Hoye’s post, Northern took 28 Guy Arabs with Park Royal bodies in 1956, 20 for the main fleet and 8 for Tynemouth. There were 10 PD2s in 1957 for Northern. All were 63 seaters. Newcastle took 20 high bridge examples in 1956, 137-156 (XVK 137-156) and 20 in 1957, 157-176 (157-176 AVK) ten of which were low bridge. The high bridge vehicles seated 62 and the low bridge vehicles 58. Living north of the Tyne, I was more familiar with the Tynemouth and Newcastle buses. I thought they were well proportioned buses, but the interior finish on the Newcastle vehicles left a lot to be desired, red painted lining panels, narrow seats and a distinct lack of ventilation. Tynemouth’s vehicles were far better finished in my view. 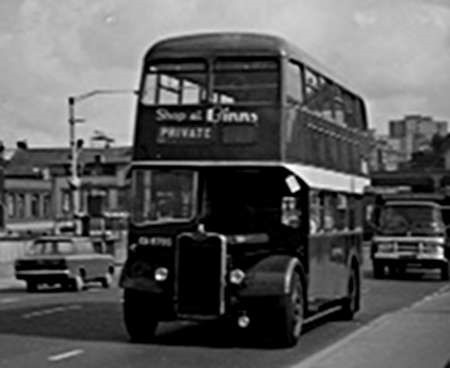 A couple of photos are attached illustrating a Northern vehicle and one of Newcastle’s 1957 high bridge buses. Your not wrong, the NCT vehicles were positively spartan in comparison to those of the NGT Group. It was the same story with the Orion bodied Leyland PD’s that followed these. Every expense seems to have been spared on the NCT vehicles, with their painted metal interiors, whereas the NGT were covered. Those of Tynemouth & Wakefields were finished to an even higher standard with moquette upholstered seats. Getting back to the Park Royal GUY Arab IV’s. As you say, Tynemouth & District had eight of them, FT 9408/15 208/15 I started as a driver at Percy Main in 1967, so by now they were nearly 11 years old, but they were VERY reliable, and for all their age they were a delight to drive, but how much better would they have been if they ha been fitted with a G6LW rather than a 5? 214 was written off after an accident, and dismantled for spares, and the remainder were transferred to Northern in 1968. By this time we had quite a number of the superb Alexander bodied CRG6LX Daimler Fleetlines, so I was probably in a minority, but I for one was sorry to see them go. I could go on a real nostalgia fest here, Ronnie. Tynemouth was my local fleet. My memories date from the mid 1950s when I can just about remember the ECW rebodied Leyland TD5s and the trio of AEC Regents rebodied by Pickering. Wallsend locals were largely in the hands of successive batches of Guy Arabs. I used these services to go the the Buddle school and later the grammar school. I recall end of school day transport at the Buddle was provided by four vehicles, two for High Farm and two for Sunholme, usually older vehicles but sometimes newly overhauled vehicles doing what I assume were running in turns. The Guys gave way to Leyland PD2s and PD3s, Atlanteans and Fleetlines. I’ll shut up now! Like you Richard, our school bus was either one of the Pickering rebodied pre war Regents or, occasionally, one of the Weymann bodied, early post war variety. As the bus came off an earlier "Workmen"s service it was usually late,a source of delight to we pupils, but consternation to the school. In 1957, I started to attend Tynemouth High School, where it was decided we lived near enough to walk to school. 4X4s were rare and mostly restricted to the farming community in those days! I remember the ECW rebodied TD5s also largely because they were quite fast and refined mechanically, for a bus of that era.They seemed to spend a lot of their time on the 5 Whitley Bay (St. Mary’s Lighthouse) to Newcastle (Haymarket)until about 1955, when they I think (its all a long time ago now) they were largely replaced on that route by the 1955 Orion bodied Guys. MUF 488 is one of those curious vehicles built by Beadles using Bedford or Leyland parts. The Leyland ones came from Tigers or Titans. In this case, the combination was delivered to Southdown in 1953, and has a FB31F body on TD5 running units. We see it outside the Southdown garage at Amberley on 13 September 2009. I suppose these days this would be called ‘recycling’. It is quite a nice looking coach although the front end lets it down a bit. Rather plain around the grille area and the joint between the upper windscreen sections and the destination display sits a bit uncomfortably. If my information is correct, the NGT group had 18 of the type. They were all built on refurbished pre war AEC Regal chassis, and although mechanically an AEC down to the last nut and bolt., none of them carried AEC badges or logos. Northern had 10 FC35F versions DCN 83/92 – 1483/92; all similar to the example above, 1483 is currently undergoing restoration in the very capable hands of the NEBPT Ltd, who set themselves very high standards, I look forward to seeing the end result. The other eight were for Wakefields Motors at Percy Main depot. Six were delivered in 1952, FT 7275/80 – 175/180, and were FC35F, the fronts differed to these, in that they had more bright trim, and an altogether softer look about them. A photo of 178 is posted elsewhere on this site. The other two FT 7791/2, 191/2 arrived in 1953, they were FC39F, as well as a larger seating capacity, they had a similar front to these which had a different destination layout incorporating a number section, to allow them to be used as D/P’s. All the P/M intake were different to those of NGT, in that they had twin cab doors and a full bulkhead separating the cab from the passenger saloon. 191/2 were sold to Garner Bridge of Weir, and 175/80 were exported to Yugoslavia of all places. The running units for this coach came from pre-war Leyland Tiger TS8 FCD 368, which was delivered to Southdown in January 1939. The original Harrington B34R body, which had been temporarily converted to B30R perimeter seating (plus up to 30 standing) during the war, was rebuilt (not rebodied) by Portsmouth Aviation in August 1947. This body was removed and sold for scrap in February 1953, and the chassis was then cut to form front and rear running units for attachment to the integral Beadle body structure. 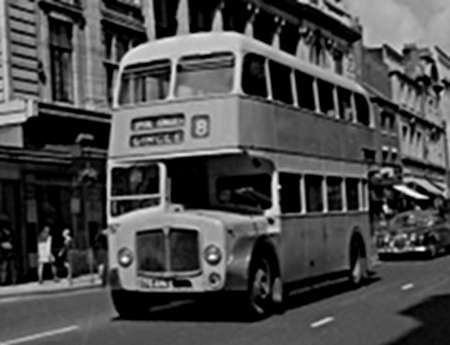 The same construction principle was adopted some years later for the London Transport Routemaster. The Beadle body was offered in 30ft or 26ft lengths, and Southdown had examples of both. 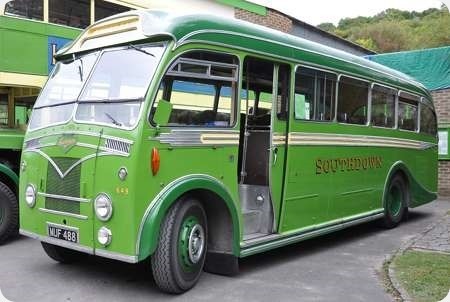 (Southdown also employed Beadle to fit full fronts of similar appearance to its Duple bodied PS1 coaches of 1947 to 1949 vintage.) 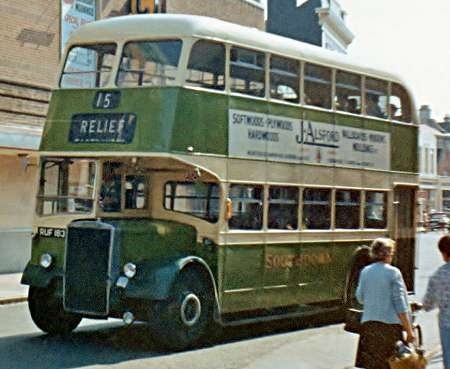 Beadle Rebuilds (as the integral conversions became generally known) were introduced also at around the same time (early 1950s) by Maidstone and District and East Kent, again using Leyland running units. This vehicle has SOUTHDOWN in capital letters, which would make it a bus rather than a coach. Thanks for your thoughts, folks. The PSVC listing for this vehicle does not show whether it is TD or TS, but it does say B31F (not FB31F). Jenkinson says TD5 with FC35F. I note that his 1978 descriptions have been out of synch with other sources before! Chris H, yes, the general view is that it is a bus, but study the script on the front. I can understand why some consider it to be a coach. Now, where did we leave the discussion about bus, coach or dual-purpose? MUF 488 used the running gear from TS8 1468 (FCD368). It was delivered as a coach (888) but downgraded to bus work and renumbered 649 in 1958. Block lettering was usually, but not exclusively used on Buses. For example, the 15xx East Lancs Royal Tigers were delivered as DP’s with block lettering, but received ‘Mackenzie script’ when converted to OMO buses. The utility Guy open topers and Northern Counties DP Leopards also had ‘Mackenzie script’ and I have seen pictures of Beadle PD2/12’s similarly adorned. The front plaque with ‘Mackenzie script’ was a device used on many vehicles in place of the usual ornate Leyland marque badges. They were also used on ‘Queen Mary’s’. Hope this helps to clear up a few points noted previously. I recall this bus on omo operations with Southdown in the 50’s-60-s before sale to a Scout Group where it was painted blue. A friend of mine Ray Oliver from Chichester bought it and ran it for a time before selling it to whoever did the current repaint restoration. Alas we lost contact many years ago. I think the current owner has a couple of Southdowns and maybe this one will be out and about soon. 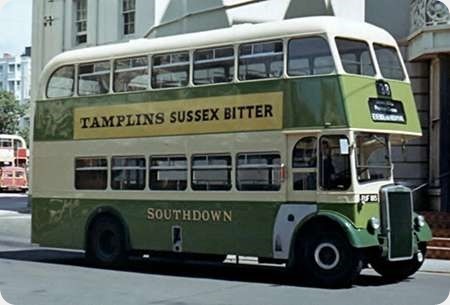 Re the Beadle re-bodied Southdown buses. Although they were mainly on the private hire/excursion work, they were used on a trial Service from Worthing to Steyning, I think numbered 66. The service ran from Worthing via North Lancing to the Sussex Pad, then along the narrow road to Bramber and Steyning. I don’t think it was a success.